Brooklyn (population 200) is one of three towns in Illinois that has been so named. This Brooklyn is located in upper-western Illinois in the northwestern portion of Schuyler County. The town is located along Illinois Route 101 just east of Illinois Route 99. The county seat of Rushville is about 10 miles to the southeast of Brooklyn (as the crow flies). We are told that in its "hey day" Brooklyn had a population of about 500. 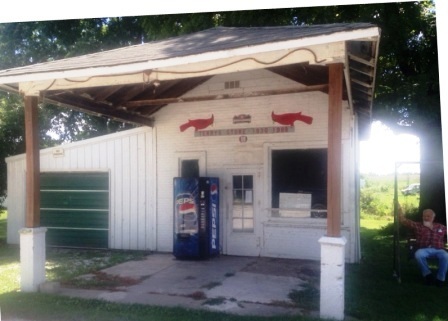 Three gas stations and a couple of grocery stores were supported by its residents and surrounding smaller communities and farm people through the 1970s. As with many small towns, the small businesses eventually closed. Brooklyn's population has steadied at around 200 residents. The residents of Brooklyn began an educational system for their children in the early years of its growth. 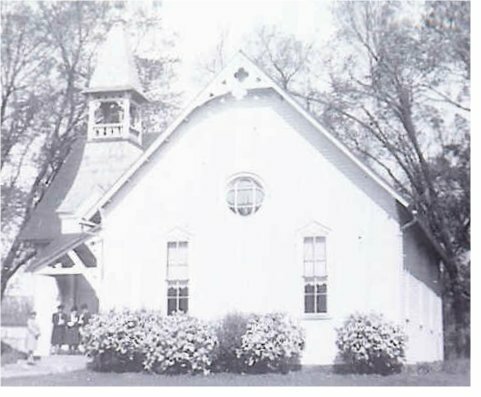 We believe a grade school was established in the late 1800s. A high school curriculum likely followed shortly after, possibly not until the early 1900s though. 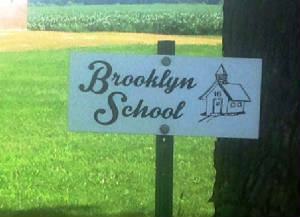 Brooklyn High School served the town of Brooklyn and the surrounding farm families for many years. The school building in town housed both the grade school and the high school classes. 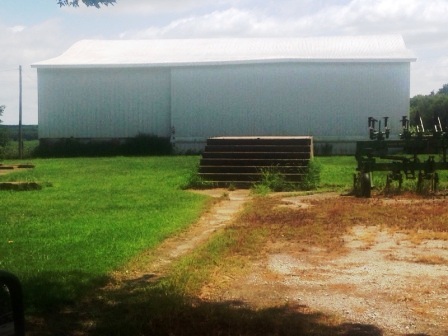 The late 1950s and early 1960s brought about consolidation talks with the county seat of Rushville. We are advised it was in the spring of 1967 that these talks became a reality. Brooklyn High School closed her doors at that time. Students were then bussed to Rushville for their educational needs. The Brooklyn High School building has been torn down. Brooklyn HS team nickname: the "Bullets"
We have been told there was a basketball program for boys at Brooklyn High. It is quit possible that baseball and track may have been offered as well. 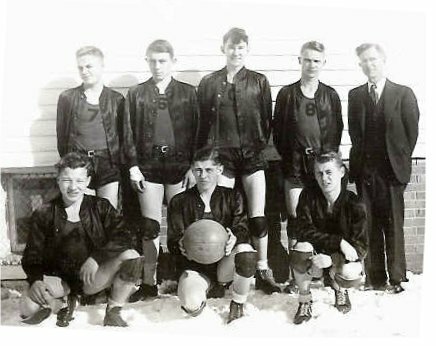 We are currently in search of the school fight song, team records, and coach's names of the teams that graced the courts and fields of Brooklyn High's storied past. "Brooklyn High School did in fact have basketball, track, and baseball programs. I was in Littleton H.S. and we competed with Brooklyn, Camden, Huntsville, Browning, Fredrick, and other three-year high schools." "The Brooklyn girls quintet, one of the strongest girls basketball teams in this section, is to meet the Adair girls team in a basketball program at the Industry High School gym tomorrow night. The Brooklyn team has lost only one game in three seasons. The Adair team has not lost a game in two years, though the McDonough team has not played as strong opponents as Brooklyn." We know that sports were not the only "game" in town at Brooklyn High. It is probable that class plays, FFA, FHA, GAA, Band, and Chorus were all a part of the BHS experience. If you have ANY information on these or other activities offered at Brooklyn High School please contact us at the address listed below. classes. Memories of this school will always be with me. It was a building of many happy moments. This school is such a pleasure to think about....very nice memories." 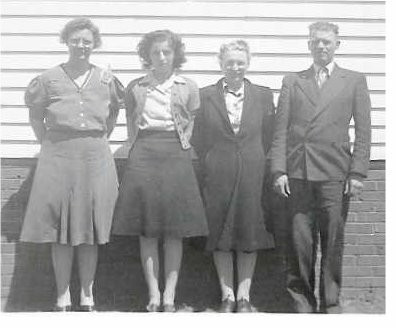 " My mother (Edna B. Lantz) taught in the grade school before I was born in 1926, and I attended grade school there through the first four grades. My teacher was Neva Reeves who later married Jesse Bartlett who was also a teacher and principle." 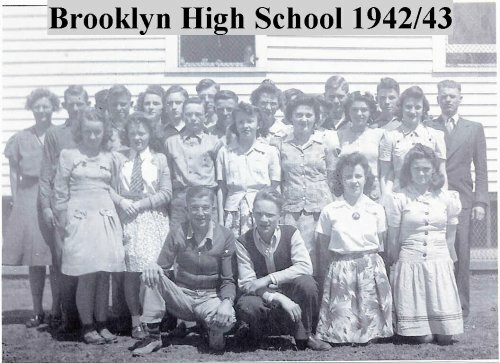 "I attended Brooklyn High School from 1940-1943 and received a good education. The principal was Mr. Lawrence Camp, Miss Aletha Linebaugh was English and Math teacher, Miss Woods taught some classes and Mrs. Chestnut was a teacher. I still have the BHS yearbook, "Echoes of 42-43". We had parties, picnics, a Christmas program, and a play "Good Gracious Grandma". We also had a band and athletics included baseball, basketball and track." 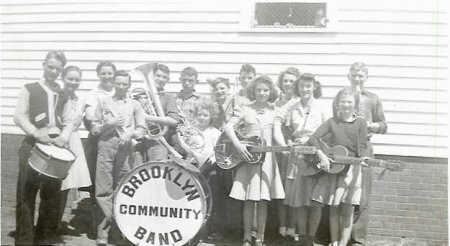 The first Brooklyn Band was organized in 1871. 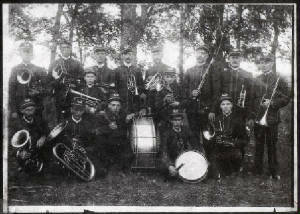 The photo of the band (below) was taken circa 1904. Dr. J.E. Camp (clarinet) was the director. They practiced in the old town hall. Merle was a small boy, he remembers going with his brother, C.W. Lantz (alto horn), to sit, watch, and listen. The band stand was two stories high -- the band played on the top floor. Speakers, master of ceremonies, kid's speaking pieces, etc, were on the bottom floor. A favorite Halloween trick for Brooklyn boys was to tear down a buggy and put it together on the top story. On Decoration Day the band marched to the cemetery, playing as they marched. The band performed concerts in other towns. 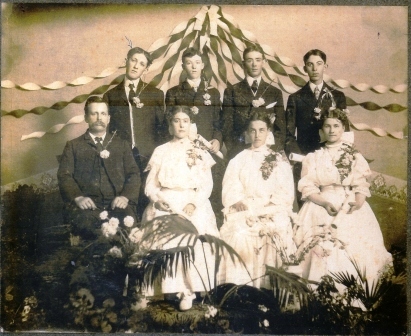 My grandfather, Thomas Lantz, drove the horses that pulled the band wagon (painted and decorated like a circus wagon). The band played while they rode through the country, often over muddy roads. The bass drum for this band is now on display in the Rushville Museum."